The Solitary Islands Marine Park is well known for its underwater gems and superior diving. Blending of tropical waters from the north with temperate waters from the south bring together a unique mix of species, including more than 550 fish, 90 corals and 600 molluscs. The islands area is a draw card for divers, with a different diving experience at each island. North Solitary Island hosts more tropical species due to the greater influence of the East Australian Current's warmer waters. It is home to Anemone Bay, which has the world's densest aggregation (or "carpet") of anemones and their anemone fish. The range of corals and fish is incredibly diverse. South Solitary Island also offers a tropical/temperate experience. Anemones and corals co-exist with kelp and cooler water species. Find 'all things big' at South Solitary, including "big" fish, such as schooling pelagics, grey nurse sharks and the giant cuttlefish, a temperate species believed to have its northernmost breeding site at this island. Visit North West Solitary Islands if you want to dive or snorkel with manta rays. Both Split Solitary and South West Solitary Island have good coral cover and a range of diving experiences. 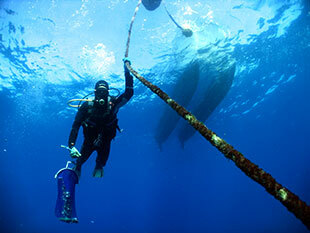 Most divers prefer to venture offshore rather than tackle the shore dives. Tour operators offer snorkelling and SCUBA diving tours most days. For more information visit Destination NSW. South Solitary Island and North Solitary Island are declared grey nurse shark aggregation sites. A code of conduct was designed to protect these sharks apply when diving and snorkelling in any sites where grey nurse sharks occur.